Friday, February 1 from 3pm at Robelle Domain, Springfield. THE markets are held on the first Friday of the month. There will be plenty of markets and food, as well as live entertainment, as well as arts and crafts. It will be a fun evening out for all the family. Friday, February 1 from 8-10pm at Studio 188, located at 188 Brisbane St, Ipswich. JESS Spina has a real passion for jazz and sharing music with others. Through her music she strives to make audiences feel at home and give them a night to remember. Tickets start at $25 each. Log on to www.studio188 .com.au to book. Saturday, February 2 from 7-9pm at Redbank Plains Recreation Reserve. 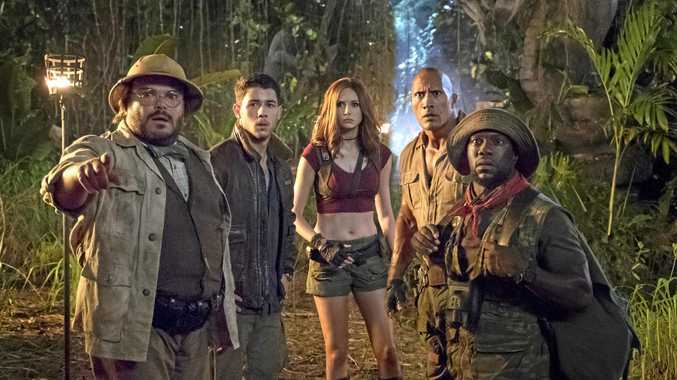 PACK a picnic and get outdoors to watch this Hollywood blockbuster featuring Dwayne 'The Rock' Johnson, Kevin Hart, Jack Black and Karen Gillan. It is free to attend. Sunday, February 3 from 1pm at 1531 Ipswich Boonah Rd, Peak Crossing. FARM tours are run at the Scenic Rim goat diary, allowing visitors the chance to see what life is like living on a farm. Kids can pat and feed baby goats, and adults can try a wide range of cheese and gelato. Tickets are $15 for adults and $5 for kids. Family passes are $35. Search Naughty Little Goats on Facebook for more information. Sunday, February 3 from 10am-2pm at Ipswich City Football Club, Workshops St, Brassall. IF your kids are looking to play soccer, head down to register and meet people from the club. For more information, log on to www.ipswichcity football. org.au/sign-on.